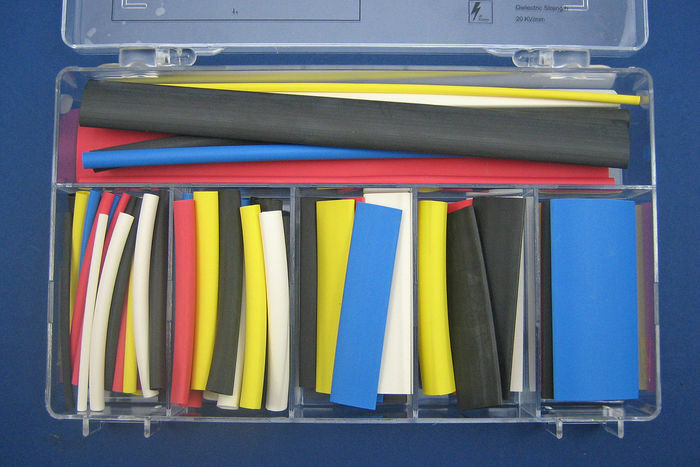 74 pieces of heatshrink sleeving, in 5 different colours (yellow, red, blue, black and white), 7 different diameters (2.4, 3.2, 4.8, 6.4, 9.5, 12.7 & 19mm - prior to shrinking) and two different lengths (70 & 200mm). Supplied in a plastic case with dividers. 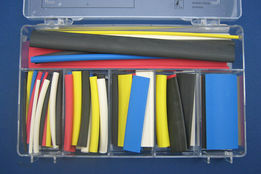 Heatshrink has a shrink ratio of 2:1, so will halve its diameter on heating.